2.4 Proteins - Welcome to The Frog Pad! Essential Idea: Proteins have a very wide range of functions in living organisms. Proteins are basic components in all living organisms. Proteins constitute about 80 percent of the dry weight of muscle, 70 percent of that of skin, and 90 percent of that of blood. The interior substance of plant cells is also composed partly of proteins. The importance of proteins is related more to their function than to their amount in an organism or tissue. All known enzymes, for example, are proteins and may occur in very minute amounts; nevertheless, these substances catalyze all metabolic reactions, enabling organisms to build up the chemical substances--other proteins, nucleic acids, carbohydrates, and lipids--that are necessary for life. 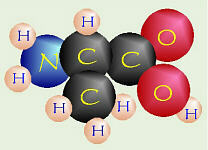 2.4.U1 Amino acids are linked together by condensation to form polypeptides. 2.4.U3 Amino acids can be linked together in any sequence giving a huge range of possible polypeptides. Humans can produce 10 of the 20 amino acids. The others must be supplied in the food. Failure to obtain enough of even 1 of the 10 essential amino acids, those that we cannot make, results in degradation of the body's proteins—muscle and so forth—to obtain the one amino acid that is needed. Unlike fat and starch, the human body does not store excess amino acids for later use—the amino acids must be in the food every day. 2.4.U4 The amino acid sequence of polypeptides is coded for by genes. 2.4.U5 A protein may consist of a single polypeptide or more than one polypeptide linked together. 2.4.U6 The amino acid sequence determines the three-dimensional conformation of a protein. 2.4.U7 Living organisms synthesize many different proteins with a wide range of functions. 2.4.U8 Every individual has a unique proteome. 2.4.S1 Drawing molecular diagrams to show the formation of a peptide bond. Wiley's interactive protein folding animation. Want to know more about proteomes? Check out The Human Proteome Project. Contribute to the science of proteins by playing Fold It!